Hypernatremia, serum sodium concentration ([Na+]) of >145 mmol/L, represents a state of total body water deficiency absolute or relative to total body Na+ and potassium. It can result from (1) water loss (e.g., diabetes insipidus [DI]), (2) hypotonic fluid loss (osmotic diarrhea), or (3) hypertonic fluid gain (Na+-containing fluids). Hypernatremia often occurs in pediatric, geriatric, and critically ill patients. Hypernatremia induces diverse effects in multiple organ systems, with short-term mortality of approximately 50%–60%. Even mild hypernatremia ([Na+]<150 mEq/L) confers a 30-day mortality of >20%. We dissect the underlying pathophysiology of two patients to help develop a treatment plan. A 79-year-old nursing home resident with hypertension and prior strokes was admitted for decrease in mental status over 5 days. On evaluation, she was somnolent, temperature was 39.5°C, BP was 140/60 mm Hg, pulse was 102/min, and respiratory rate was 24/min (baseline weight of 56 kg). Her breath sounds were reduced; chest x-ray revealed a lobar pneumonia. Laboratory studies showed serum [Na+] of 170 mEq/L, serum creatinine of 1.5 mg/dl, and urine osmolality of 780 mOsm/kg. She was given 1 L of saline en route. A 35-year-old woman with bipolar disorder and past suicide attempts presented with polyuria and frequent bedwetting. She had been on lithium carbonate (600 mg twice daily) for 7 months. Recently, she had a fasting serum [Na+] of 147 mEq/L and serum lithium level of 0.8 (therapeutic range: approximately 0.6–1.2) mmol/L. Her examination was unremarkable: BP was 100/58 mm Hg, and heart rate was 90/min. Serum [Na+] was 144 mEq/L, and creatinine was 0.8 mg/dl; 24-hour urine volume was 5.7 L, and osmolality was 160 mOsm/kg. Under physiologic conditions, normonatremia is achieved through thirst-driven water intake and arginine vasopressin (AVP)–mediated water conservation in the kidney. Although the kidney has historically been considered “The Organ” with capacity to regulate Na+ balance, recent studies have shown tissue (mainly skin) storage pools of Na+ that can be mobilized in and out of extracellular fluids (ECFs) and that likely participate in Na+ homeostasis. Hypernatremia increases ECF osmolality and tonicity, causing water efflux and generating a cell shrinkage force (Figure 1). The latter triggers an adaptive regulatory volume increase, which imports ionic osmolytes (Na+, K+, and Cl−) within minutes, with water following suit. This countershrinkage response is, however, a short-term fix, because the ions are highly cytotoxic. Fortunately, the osmostress evokes another set of responses via tonicity-responsive enhancer binding protein (TonEBP), a ubiquitously expressed transcriptional factor. TonEBP drives cellular accumulation of less toxic organic osmolytes (mainly myoinositol, sorbitol, betaine, and taurine) and proadaptive chaperon proteins. These molecules, within hours to days, replace the ionic osmolytes. The adapted cells are, however, far from normal. Molecular crowding and multiple functions exerted by the organic osmolytes can disrupt intracellular milieu. Moreover, through its transcriptional activity, TonEBP can increase cellular reactive oxygen species and cytokines. Thus, barring correction of hypernatremia, ongoing cell damage persists. Cellular adaptation and relations of serum and urine osmolality. 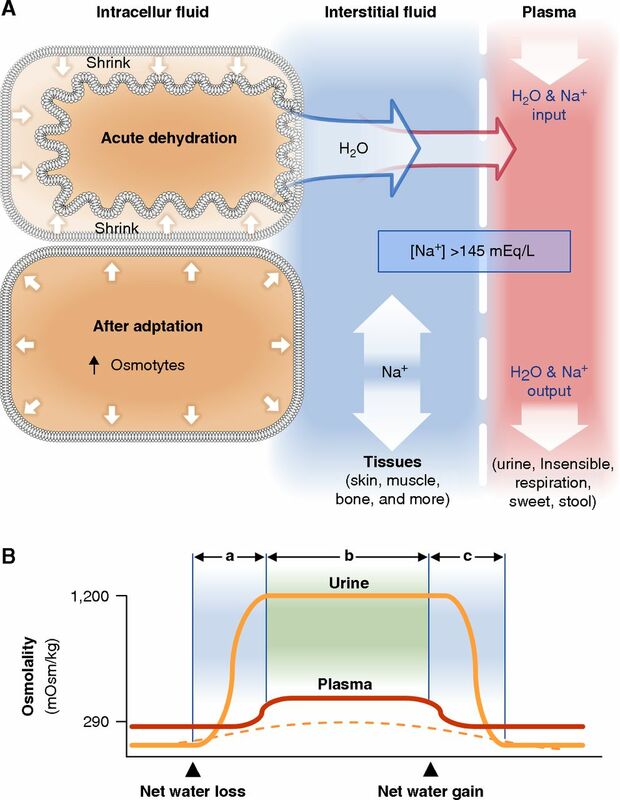 (A) Hypernatremia causes a rapid osmotic water efflux, which activates regulatory volume increase. The latter counters the cell shrinkage force by initially gathering ionic osmolytes (within minutes) and subsequently, through a transcriptional process, replacing the ionic osmolytes with more compatible organic osmolytes (within hours to days). The accumulation of intracellular organic osmolytes, although less toxic, can cause multiple cellular dysfunctions as evidenced by continued DNA breakdown and oxidative stress. Tissue can buffer extracellular fluid Na+ and constitutes another potential aspect of Na+ concentration regulation. Until hyperosmolality is corrected, these abnormalities persist. (B) The relationship between plasma and urine osmolality during the (a) genesis, (b) adaptation, and (c) correction (resolution) phases of a hypernatremia episode is depicted. Our first patient had an adequate kidney response to antidiuretic hormone, arginine vasopressin. Her urine became concentrated (solid yellow line) before the elevation of serum osmolality. During resolution (fluid administration), the serum osmolality returned to normal before urine dilution. The dotted yellow line represents our second patient. Her urine concentration would be minimally increased despite elevation of serum osmolality, consistent with lithium-induced nephrogenic diabetes insipidus. During hypernatremia correction, downward shift of the ECF tonicity (by hypotonic fluid administration) causes water influx into the cell, creating a cell-swelling force, which activates regulatory volume decrease. During this process, excess osmolytes are expelled, and cells return to their normal state. Rapid correction (abrupt fall in ECF tonicity) can outpace this regulatory volume decrease, causing cell swelling and irreversible damage. Lithium is the most common cause of acquired nephrogenic DI. It is believed that lithium competes with Na+ and Mg2+ in their binding to several proteins and exerts mainly inhibitory effects. Glycogen synthase kinase-3β (GSK3β), an Mg2+-dependent lithium-sensitive enzyme, represents a major lithium-affected pathway. In the kidney, lithium-mediated GSK3β inhibition (1) moderates adenylyl cyclase–mediated cAMP production and (2) releases the inhibitory effects of GSK3β on cyclooxygenase-2, leading to unrestrained prostaglandins (PG) generation. Both effects impair AVP-mediated water transport, inducing a state of AVP resistance and nephrogenic DI. Lithium also interferes with tubular Na+ absorption and blunts aldosterone responsiveness. Excess tubular fluid Na+ creates osmostress and constricts afferent arterioles, risking tubular injury and glomerular ischemia. Long-term lithium exposure and intracellular lithium accumulation have been associated with kidney tubulointerstitial scarring, microcyst formation, CKD, and occasionally, end stage kidney failure. History and physical examination typically reveal the etiology and duration of hypernatremia. In patient 1, increased insensible water loss (pyrexia), impaired thirst, and possible lack of water provision resulted in hypernatremia. Patient 2 (lithium exposure, dilute urine, and high-normal [Na+]) is consistent with lithium-induced nephrogenic DI. Water deprivation study (1) is the test of choice for diagnosing DI. It entails water deprivation (to induce hypernatremia, [Na+] approximately 150 mEq/L) followed by vasopressin challenge. Serum [Na+] and urine concentrations are serially monitored. Increase in urine concentration with the vasopressin challenge is consistent with central DI. If urine remains dilute, nephrogenic DI is present. Diagnostic dilemma often arises in patients with partial DI (1). The study should be conducted in a controlled setting to prevent complications, including symptomatic dehydration and postvasopressin acute water intoxication. Copeptin, a surrogate marker of circulating AVP, has emerged as a diagnostic test for differentiating polyuria due to primary polydipsia and central DI (2). For nephrogenic DI (patient 2), a baseline (without water deprivation) serum copeptin can confirm the diagnosis (3). Hypernatremia for <48 hours is considered acute; [Na+] correction rate can be up to 1 mEq/L per hour. Hypernatremia of 2 days or unknown duration is considered chronic and should be corrected gradually, <0.5 mEq/L per hour (approximately 10 mEq/L per day). There have been newer corroborating observations showing a higher mortality rate with (1) [Na+] correction >0.5 mEq/L per hour (compared with approximately 0.35–0.45 mEq/L per hour) in neonates with [Na+]>150 mEq/L (4) and (2) slow correction of <0.25 mEq/L per hour in adults with [Na+]>155 mEq/L (5). Additional studies have also shown a negative effect of slow [Na+] correction (>3–4 days) on mental status recovery (6) and survival (6,7). These observations are consistent with growing knowledge of an asymmetric time course in the genesis and dissipation of cellular osmolytes. Interventional studies would be ideal to further clarify the optimal [Na+] correction rate. For patients with hypovolemia, volume correction with isotonic fluids takes precedence. Urine [Na+] is unreliable as a volume indicator, because it can be elevated due to dehydration natriuresis (8). Water repletion should commence after volume stabilization. The amount of water administration can be estimated initially by determining the total body water deficit: body weight (kilograms) ×(0.5 for women; 0.6 for men) × (serum [Na+]/140–1). Water may be given orally if tolerated. Of importance, existing formulas perform poorly in predicting the expected [Na+] change with a given volume of water administration. It is, therefore, imperative to monitor serum [Na+], often every 2 hours initially, to control the speed of correction. For patient 1, her water deficit was approximately 6 L [56×0.5×(170/140–1)]. Assuming (1) insensible loss to be approximately 1.2 L/d (600 ml skin and 600 ml respiratory loss) and (2) urine and stool output to be zero, to correct her [Na+] to approximately 142–145 mEq/L (from 170) in 3 days, she would need approximately 9.6 L of water (6 L deficit +3.6 L insensible loss). We thus initiated 5% dextrose water infusion at 130 ml/h (3.12 L/d). Note that these estimates do not include her future urine/stool output or potential tissue Na+ mobilization, and they serve only as a starting reference. Her [Na+] was monitored closely, and the infusion rate was adjusted to keep the correction at approximately 0.4 mEq/L per hour. She reached normonatremia in 3 days and regained mental lucidity. Treatment for DI is on the basis of etiology; desmopressin is effective for central DI (1). For lithium-induced nephrogenic DI (patient 2), options include (1) dosing lithium once daily to minimize exposure, (2) adding amiloride to impede distal tubular lithium uptake via epithelial sodium channels, (3) adding thiazide to augment (AVP-independent) aquaporin 2 expression and reduce tubular Na+ load, and (4) adding indomethacin to suppress PG production. Option 3 enhances proximal tubular lithium absorption, and thus, it requires lithium dose reduction (by approximately one third) and close monitoring to avoid toxicity. Option 4 is limited by the risk of kidney toxicity. A low-salt diet should always be incorporated. Other agents showing promise include sildenafil, simvastatin, metformin, clopidogrel, PGE2 receptor 4 stimulator (9), and recently, acetazolamide (10). Additional patient-based studies are required before clinical consideration. For our patient, lithium dosing was consolidated, and amiloride was added (10 mg daily). With adjunct low-salt diet, her urine output declined to 3.7 L/d at 1 month follow-up. Hypernatremia is common in at-risk populations. Sustained hypernatremia can cause irreversible cell/organ damage and high mortality. Clinical presentations generally reveal the causes and duration of hypernatremia. Copeptin can be useful in diagnosing DI. Cause elimination and correction of [Na+] in a timely fashion by monitoring measured [Na+] are critical.